There is no doubt that Chelsea are currently experiencing their longest run of success in over a century of football. Since the turn of the century, the club has won the Premier League title on five occasions, bettered only by Manchester United in that period. In the 2004/05 EPL season, Chelsea set the current English record for the highest points total in a league season (95) and the highest number of clean sheets (25) in what was a statement of intent to the rest of the league. While Chelsea's 2016/17 league championship wasn't quite as emphatic, they still managed to win it with considerable ease over nearest rivals Tottenham (seven points behind) and Manchester City (fifteen points behind). After a slow start, the Blues put together a remarkable streak of thirteen consecutive wins, taking top spot after matchday eleven and holding on to that position for the remainder of the season. Chelsea's success can be attributed to a number of key factors. A lack of injuries throughout the season helped bring regularity to a team, such a crucial ingredient in modern football. Centre-half Cesar Azpilicueta played every minute of the season, N'Golo Kante was a constant in midfield, while Diego Costa and Eden Hazard proved almost unstoppable in the front third. A lack of European football also allowed the club to focus solely on the Premier League for much of the season, without the need to implement squad rotation. There will be no such luxury in 2017/18 as Chelsea will feature in the Champions League and be forced to rely on their depth at certain stages of the campaign. This is where a top manager like Antonio Conte earns his money, and it will be great to see the teams he produces. Conte was incredible during his first full season at the helm of the London club. His animated touchline antics were obviously well received by the playing gxroup who produced some exceptional performances throughout the successful season. As defending champions, and with a list of top transfer targets to boost their squad, you would expect the club to be favourites to win the title again this season. However, according to Bet365.com the Blues sit in third at odds of +350 behind both Manchester clubs. City are favourites and are offering up very short odds (+187), while United are second on the list at +333. Although there is a long season ahead, their current price presents good value for the Blues. In my opinion, they have a better squad than Manchester City with a proven winning formula, and Manchester United's style is yet to reap rewards for Jose Mourinho. If Chelsea can manage their squad throughout their busy schedule better than the other big clubs, there is a great chance of going back-to back. In saying this, my advice is to hold off on placing a bet as it stands. 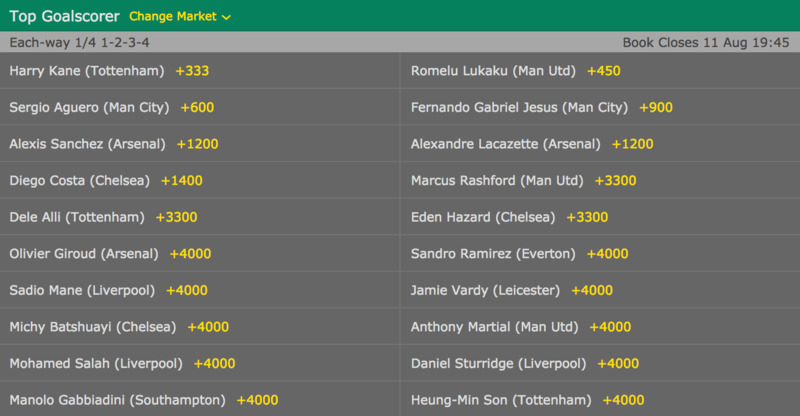 Chelsea's odds are unlikely to fluctuate too much before the season gets underway, and you should at least have a look at how the team lines up in the opening few rounds before locking in your bet. You can be sure that we will provide you with the best odds from a selection of the top sportsbooks, so stay tuned and jump on when the time is right. While it's clear that a schedule sans European competition was a bonus last season, the club still needs to be credited for an emphatic display in which they simply accumulated more points than their rivals. 17 wins from 19 home matches and a total of 51 points is a fantastic return which set up their title victory, while their away form was the best in the league. Chelsea also proved last season that a team can still win the title after a moderate start to the campaign. While Manchester City jumped out of the blocks with six consecutive wins, Chelsea sat eighth on the table with ten points from their opening six matches, and a comprehensive loss to Arsenal at The Emirates stadium certainly raised concerns. They didn't look back as they recorded thirteen-straight from their seventh match onwards. Chelsea vs Burnley - Saturday, August 12th @ 3:00pm (GMT) - The opening match of the season is at Stamford Bridge against a side that should not cause the champions any problems. This first match is the perfect time for Chelsea to build confidence as they head into tougher matches. Tottenham vs Chelsea - Sunday, August 20th @ 4:00pm (GMT) - Tottenham were one of just five teams to defeat Chelsea last season and will also be playing their first league match at Wembley. This match is sure to attract a huge crowd and will be a big test for Conte's men in just their second Premier League outing for the year. Chelsea vs Everton - Saturday, August 26th @ 3:00pm (GMT) - Chelsea's round three opponent is Everton and the Toffees have really recruited strongly for this season as they continue their push to crack into England's top six clubs. Chelsea had no problems against the Merseysiders last year, recording 3-0 and 5-0 victories, and will be looking for a repeat at home. Chelsea vs Manchester City - Saturday, September 30th @ 5:30pm (GMT) - Matchday seven features a clash between two of the pre-season favourites and this match may prove crucial in deciding the eventual EPL winner. Antonio Conte managed to beat Guardiola's men both home and away last season and will be intent on defeating City on their home patch. There will be fantastic odds available for each of these matches, and we will provide you with all the latest information and gameday previews right here. Chelsea have been one of the more productive sides in the transfer window so far this summer, and their activity shows no sign of slowing. We should get a decent insight into Antonio Conte's thinking when the team runs out for the Community Shield against Arsenal on Sunday August 6th, although teams traditionally keep cards fairly close when they run out for the season opener. Unlike Liverpool, Tottenham and even Arsenal, Chelsea should not have to worry too much about their best players being poached by other clubs. Naturally there have been rumours, and none are more concerning than the possibility of N'Golo Kante joining Real Madrid. With the chance at achieving back-to-back titles plus a shot at Champions League glory, it seems crazy that a player would leave. Then again, who wouldn't want to play under Zinedine Zidane with the likes of Cristiano Ronaldo? One name that is sure to excite Chelsea fans ahead of the upcoming season is Tiemoue Bakayoko. The French defensive midfielder signed from Monaco and is rated very highly, having already starred for the French national team. At 22 years of age, he has the potential to serve the club for a long time and will definitely star in the Blues' title defence. At the time of writing, Chelsea are also closing in on a deal with Real Madrid for Alvaro Morata, who will be a more than adequate replacement for Diego Costa if he leaves the club as expected. Chelsea had no problems scoring goals last season when Costa was interested, but he became somewhat disengaged during the campaign and Chelsea will be hoping Morata can fill the void. Eden Hazard will be critical to the fortunes of the Blues in 2017/18. The success of the club has moved parallel to his form - he was named player of the season in 2014/15 when Chelsea won the title under Jose Mourinho, then was totally absent in the following campaign when Chelsea limped to a tenth-place finish. Last season he finished behind Costa as the club's top goalscorer and was back to his best, and fans will hope to see the same again. With so many talented players already in the squad, Chelsea will have plenty of options as they move into the upcoming season. If Antonio Conte can effectively manoeuvre the side through both it's Champions League and Premier League fixtures, and if the side can stay mostly injury free, there is a great chance Chelsea will be lifting at least one trophy in the 2017/18 season. If you believe Chelsea are in with a shot, don't forget that we provide you with the best sportsbooks who offer a wide variety of lines at the greatest odds. If you're lucky, you could be celebrating just as hard as the Chelsea players at the end of the season. You can also join in the conversation on Facebook and chat to other fans about Chelsea's chances.